WASHINGTON — A U.S. airstrike in Syria has killed a key figure in a dangerous al-Qaida offshoot, the Pentagon said Tuesday. Muhsin al-Fadhli was killed in a July 8 air attack while traveling in a vehicle near Sarmada, Syria, Pentagon spokesman Capt. Jeff Davis said in a statement. Davis did not further elaborate on the nature of the air strike, such as whether al-Fadhli was killed by a drone or a piloted aircraft. Al-Fadhli was a leader of the Khorasan Group, a cadre of al-Qaida operatives who were sent from Pakistan to Syria to plot attacks on the West. Officials say the Khorasan Group is embedded in the al Nusra front, Syria’s al-Qaida affiliate. 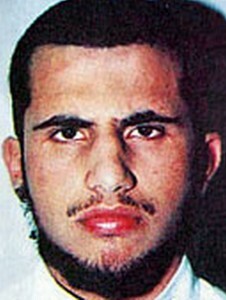 Previously based in Iran, al-Fadhli was the subject of a $7 million reward by the State Department for information leading to his capture or death. He had been falsely reported as having been killed last fall. Al-Fadhli was also involved in October 2002 attacks against U.S. Marines on Faylaka Island in Kuwait and on the French ship MV Limburg, Davis said. Officials have said that the Khorasan militants were sent to Syria by al-Qaida leader Ayman al-Zawahiri to recruit Europeans and Americans whose passports allow them to board a U.S.-bound airliner with less scrutiny from security officials. According to classified U.S. intelligence assessments, the Khorasan militants have been working with bomb-makers from al-Qaida’s Yemen affiliate to test new ways to slip explosives past airport security. Officials feared the Khorasan militants would provide these sophisticated explosives to their Western recruits who could sneak them onto U.S.-bound flights. Because of intelligence about the collaboration among the Khorasan group, al-Qaida’s Yemeni bomb-makers and Western extremists, the Transportation Security Administration decided last July to ban uncharged mobile phones and laptops from flights to the U.S. that originated in Europe and the Middle East. The Khorasan group remains a threat, American officials said. Its existence demonstrates that core al-Qaida in Pakistan can still threaten the West, despite the damage done to that organization by years of drone missile strikes. The U.S. military has periodically targeted the group as part of its air campaign in Syria, beginning with eight strikes against Khorasan targets last September. Among those who have so far survived the bombs is a French-born jihadist who fought in Afghanistan with a military prowess that is of great concern to U.S. intelligence officials. David Drugeon, who was born in the Brittany region and converted to Islam as a youth, spent time with al-Qaida in the tribal areas of Pakistan before traveling to Syria, French officials say.